Welcome! The lobby of the Deranged L.A. Crimes theater is open. Grab a bucket of popcorn, some Milk Duds and a Coke and find a seat. 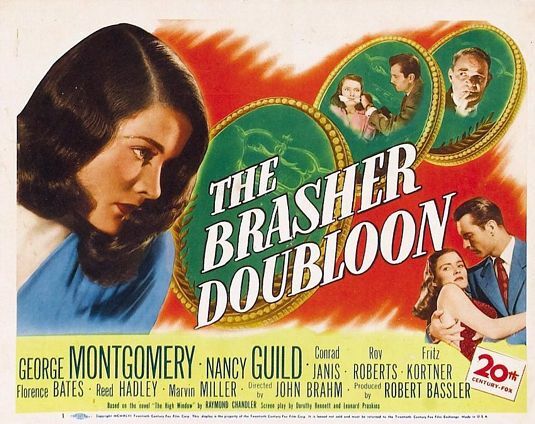 Tonight’s feature is THE BRASHER DOUBLOON starring George Montgomery, Nancy Guild and Conrad Janis. Philip Marlowe (George Montgomery) gets involved when limp-wristed and snidley Leslie Murdock (Conrad Janis) steals a rare doubloon from his mother (Florence Bates) to give to a newsreel photographer in exchange for film that is being used for blackmail purposes. Marlowe’s involvement has him encounter a girl who goes into hysterics when touched by a man; a husband-killing woman; three corpses; a couple of scuffles in which he gets his clock cleaned; a secretary who thinks she has killed her boss, which is the reason Raymond Chandler called his story “The High Window”, and a son (who qualifies as a S.O.B. by two definitions) who blackmails his widowed mother. So, what’s not to like.